I just thought I'd point out that though our name is Business Blogging Pros, we're about more than just blogs. I've been active on Twitter for almost two years and have started giving webinars to help businesses use Twitter. You hear a lot about Social Media Marketing these days. I've been teaching business owners how to engage in social media marketing programs for two years - we just haven't been calling it that. Over the next several months, you can expect to see a broadening of our focus though - some way to make the brand be known for more than just blogs. Part of this process is deciding on a name. Business Blogging Pros is a great name and one of our challenges is to come up with a new name - be it a variation or extension of the current name vs an entirely new name - that is as memorable as Business Blogging Pros. Whatever happens, it will be an adventure. 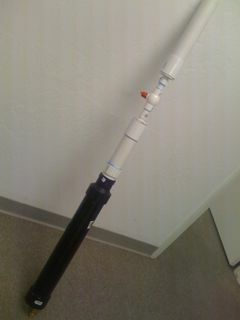 This compressed-air cannon is for a YouTube video I'm going to do with one of my clients in about a month. David Meerman Scott on Web Ink Now wrote a great post yesterday about the definitions of some of these terms we bandy about like New Rules of Marketing, Web 2.0 Marketing, Social Media Marketing, and Social Network Marketing. I'm pretty much in agreement with David's definitions. One thing interesting to me are the parallels between David's book, The New Rules of Marketing and PR and Gonzo Marketing, written by Chris Locke way back in 2001. It is interesting to see these two very different guys present the same message in very different ways. On one hand, I think that Chris has never gotten the recognition he deserved for Gonzo. IMHO, some of what he wrote was truly groundbreaking at the time. On the other hand. if you are trying to convince your CEO of your point of view, you would be FAR better off giving him New Rules than Gonzo. There is a lot of Chris' personality in Gonzo and you have to have suffered some kind of warpage to 'get' Chris. (I think I do 'get' Chris - I don't know if that's a good thing or a bad thing - and I am privileged to consider him one of my mentors.) Some of the stuff on Chris's blog would definitely not go over well in a Fortune 500 company boardroom. David's New Rules, on the other hand, is written in a language your CEO will understand. And don't get me wrong, that's not a slap to Chris either. Chris and I know each other well enough that I'm comfortable asking him for advice. I wish I new David that well too. I think getting advice from two such totally different perspectives would be really useful to me. 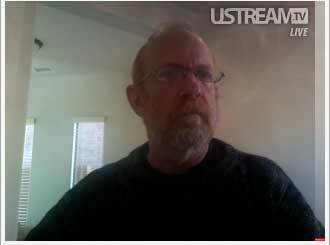 Thanks to Jody Gnant, I am now UStreamer. Ustream allows just about anyone to broadcast live video over the Internet and interact in near realtime with connected viewers using chat. In fact, I am LiveStreaming right now. Tomorrow when I am preparing dinner for a couple of guests, I will be LiveStreaming while I cook. I'm also going to record the video and imbed it into my food blog so that later anyone can learn to prepare Chicken Legs with Raspberry Sauce, Bistro style. Back to Jody. I was at the Phoenix Social Media Club meeting Thursday night and Francine Hardaway invited Jody to talk about uStream. Remember Kyle MacDonald who managed to turn one red paperclip into a house through a series of trades? Jody is a local singer-songwriter and traded with Kyle for a recording contract. Jody began LiveStreaming 24/7 during the creation and promotion of her new CD and has since decided to continue. As a result, she has developed a considerable following, with several thousand 'views' per month. One phrase she said really struck me. Pointing to her webcam, she said, "Those are real people in there." Most of them are enthusiastic fans. Most of them have bought her music. I don't want to pontificate, but with guys like Robert Scoble and Shel Israel exited about UStream, I think it is safe to say that it is a great idea. I've already got several ideas about using this with some of my clients. A couple of Days ago, Steve Groves posted a good article about the Internet coming of age and some of Marc Andreessen's thoughts. Yes, I know we have these. In fact we had them long before the World Wide Web existed. They were called Usenet Groups. In fact, back in the early days o accessing the internet (does anyone else remember Shell Accounts?) I switched ISPs so I could gain access to alt.security.pgp. My definition of a community is a number of individuals who have come together around a specific topic, and that number of individuals must be small enough for trust relationships to be maintains between most members of the community. A person can probably maintain a few dozen trust relationships, but certainly not a few thousand. That is why I think there will be dozens/hundreds/thousands of nearly identical communities all cenetered around the same topic. It is interesting that Marc Andreessen's new venture Ning allows anyone to set up an online community. I believe there is a hazard to that: The whole world could easily devolve into each of us having our own 'community' of which the owner is the only member. I saw a lot of that happen in Ham radio in the seventies and eighties: It became so easy to put up a 2-meter repeater that we ended up with repeaters on the air handling almost zero traffic simply due to the fact that anyone with an ego and a checkbook could say he had his own repeater. Will we devolve to the point where anyone with an ego can say he/she runs an online community? I don't know. I do know that the only thing that saved VHF Ham radio was the limited availability of RF spectrum. There is no such equivalent limitation on the Internet today. Even though I may be a member of an online community focused on widgets, it would be nice to know what is going on in the world that is related to widgets. Right now this is a difficult, time-consuming problem. It takes a lot of effort and energy to stay abreast of all the happenings on any topic. I think some sort of new social media search and filtering entity is needed. Technorati does a good job, but it's far rfom perfect. Maybe the anser is something like Yahoo! Pipes or some sort of Squidoo 'meta lens'. A long time ago, (when dinosaurs roamed the earth, in fact) I envisioned a briefcase-sized device with a keyboard and screen that contained or was connected to a giant database holding every bit of knowledge in the known world. The Library at Alexandria with a handle, so to speak. You could type in a plain-lannguage question and it would return the answer in plain language. I think we are there from a data perspective but we are a long way from being there for the plain-language part. Find other blogs speaking to the same audience as yours. Read those blogs on a regular basis, preferable once a week. Leave comments on those blogs. Write on your own blog about topics found on other blogs and link/trackback to those posts. In addition, systematically scan the blogosphere for mentions of you, your company, your URLs, trademarks, etc. What Steve didn't realize is that I do that regularly, but I'm doing that very thing for some of my clients. Some people just don't have time to scan the blogosphere like they should. For example, I have a client with multiple blogs on disparate subjects and a dozen or so URLs. Even with an RSS reader, it takes about five hours a week to keep up with all of that and he just doesn't have the five hours. I act as a driftnet, monitoring about 180 blogs and google searches, and send him an email once or twice a week containing one or two dozen blog posts. From those, he picks a smaller number that he finds compelling and leaves comments. It saves him a ton of legwork. To him, it is worth it to have me do the legwork for him. I, some cases, I also do this for other smaller clients as part of the ongoing blog coaching I offer even though it involves only about an hour a week. The reason is simple. I find that it takes most business owners 3-6 months to to really get into the groove of blogging. Regular presonal coaching during this period of time helps jump start them and get the good habits engrained. So part of my coaching is hand-holding: directing their attention to good opportunities to leave comments, help them stay engaged in the blogospher's conversations, etc. Yea, I really need to start carving out some time for myself, but helping my clients be successful bloggers is important too. As a result of reading one of Connie's blog posts, someone from a large corporation called her and asked her to write an article on the same topic for their publication. How's that for the power of blogging? My good friend Michael Goodman and I have been having a discussion about email newsletters vs email RSS feeds. If you've been to my website, You notice that I have a newsletter. And if you look at the sidebar of this blog, you'll notice that you can sign up to receive the RSS feed of this blog via email. In other words, I have implemented both. You would think that the email RSS feed would make the newsletter superfluous, and I predict that in the not-to-distant future the classic email newsletter will be dead. For now, however, more people sign up for the newsletter than the email'ed RSS feed. I track about a hundred blogs via RSS. Many times, I want to refer back to something that I read a few days or a few weeks ago. I know I read it in one of those blogs, but which one? It would be nice if I could tell Google's Blog Search to limit its search to only the blogs in my Google Reader. Northestern University and Backbone Media have recently published a study of the factors that make a business blog successful. They interviewed twenty highly successful corporate bloggers and asked each one a series of stndardized questions. Engaging other bloggers in online conversation is crucial to your blog's success. Locate and read other blogs in your industry and leave thoughtful comments on them oftem. Even before you write the first post on your blog, you should be searching the online world for places where conversation and discussion about your industry occurs. Create interesting, compelling content. Write about your industry, your marketplace, and the concerns of your customers related to your industry. Write about ideas and events that encourage reader feedback, and then leverage that feedback. Be open, transparent, and real. Don't be afraid to reveal the human side of the inner workings of your business. Be open and forthcoming about how or why decisions are made that affect your customers. The Stonyfield Farm blog was the most successful blog run by Stonyfield Farm. Jonathan the farmer, Stonyfield’s organic farming blogger, writes about whatever is happening in his life, the calving season or maple sugar season. The success of the Stonyfield Farm organic farming blog is because it is all about a farmer’s unique experiences in farming an organic farm. What must seem mundane to the farmer is refreshing, compelling and entertaining content to most readers. I can't emphasize enough how important I think this is. This is the kind of content that creates a bond between you and your customers or potential customers. Local Businesses - Blog or Not? Mike Manual at Media Guerrilla wrote an interesting and provocative post today in which he advocates Yahoo! Local and Google Local over blogging for small businesses. This is surprising coming from a blogger. I disagree with Mike and suspect that he does not really understand what a blog can do for a small business, or perhaps the profile of his typical client is quite different from mine. Mike advocates encouraging your customers to share their experiences with your business in local search engines like Yahoo! Local or Google Local. There is no doubt that a bunch of positive reviews about your business on a local search engine will help. Nothing is as powerful as word-of-mouth advertising. Does the number of reviews at local.google.com affect your Google rankings? I don't know. Getting clients to actually spend the time and energy to write and post a review is a problem. And you're going to have to take the bad with the good. You don't have control over what gets published about you on Yahoo! Local or Google Local, but you do have control of the testimonials you publish on your website and your blog, and you can respond. The mainstream media folks read and monitor the blogosphere. A single thoughtful blog post on a controversial subject can result in a whole lot of exposure in the mainstream media. I don't think you can say that about local search engine listings. While the local search engine reviews do give you some exposure, a blog is your best option for having your own words heard. If you are a consultant who has amassed years of experience in your field, no one can showcase that better that you. A local search engine listing is no match for a blog in this regard. A blog allows your potential clients to gain an appreciation for the bredth and depth of your experience and knowledge. The idea situation is to educate your potential customers to the point where they realize that they need help and you are very qualified to give it. What can you do about those negative reviews on the local search engine? Not much. A negative review (in the form of a comment) on your blog gives you a chance to respond. I recently told one client that he should pray for a negative comment because it would present him with a golden opportunity to show the world how he responds. Your business is built upon relationships. Your clients don't do business with your company, they do business with you. A blog is a wonderful tool for allowing people to see you as a three-dimensional person instead of just a cold business. Granted, a good testimonial on Yahoo! Local can do that too but the blog wins hands-down in this department too. Surfing Google Local is probably not a great way to hear what other experts in your field are talking about. A blog however allows you to engage them in conversation and learn from each other. And remember, Markets are Conversations and we can learn from them. I think Mike is seeing a blog as a big time sink. It can be, but DL Byron to Click-N-Seal from zero sales to 100,000 unit/yr with nothing more than a daily blog post. (Actually, I think he recently said that his posts are about twice weekly.) I think this is far less effort than it would take to coax a couple of decent reviews per week out of your customer base. I've been looking at RSS readers lately. Evryone with a blog needs a constant source of new ideas to write about. And you need to stay abreast of what the blogosphere is talking about in your niche. There is no better way to accomplish this than RSS and an RSS reader. I plan to do a blogging 101 post soon surveying the best RSS readers and as a result have been looking at several. If you have a Mac then you already have the best RSS reader: Safari. The ability to click on the little RSS icon in the address bar and then add the feed to the folder of your choice is really convienient. I understand that IE7 will have a built-in RSS reader. Personally, I think the best place for the RSS reader is right in the browser. I also use NetNewsWire (from the NewsGator people) and I like it a lot. John at has a great post up about local search. One of the things I am trying to to is to put together a list of resources for doing local search. I also think that a blog is just as important (maybe more-so) for acquiring and keeping local customers as it is for spreading the word globally. I often ask people to think about how they themselves pick companies to do business with. Usually it starts with a Google search and then further online research to try to get to know the companies a little better. People search for a local business no differently. Not only will your blog boost your Google rankings, it will allow your potential customers to get to know you and personally connect with you before they walk in the door for the first time.